Now you can track every action in your client application using our SDKs with the new Analytics feature. Check which platform your clients are using, which OS, which pages in your app are frequently openend or create funnel analysis. 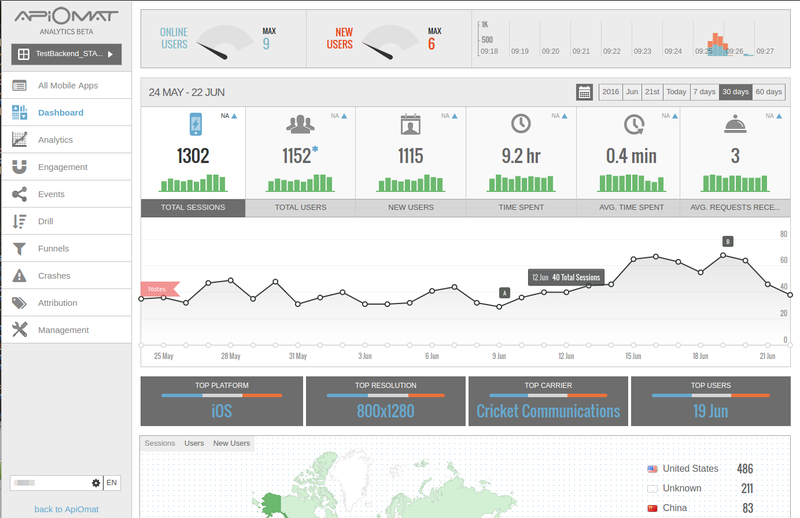 We provide a dedicated Dashboard for configuring your events, funnels or further analytics. If you develop your own backend using ApiOmat you are likely to encounter the question of user authentication. On the one hand the Authentication ClassesAuthentication Classesfeature enables developers to provide their own authentication implementation, and on the other hand multiple created or existing ones can be selected per backend. By using an ordered list of authentication classes you can utilize several different methods of authentication without packing all the logic in one class. You can even use authentication methods already implemented in other modules. For example let's say you have users sending requests to your backend and their accounts are located in three different third party systems with each of the systems providing their own authentication interface. Then implement the authentication against these systems in three different classes and use them in your backend(s) in whatever order and combination you like.